From the moment you pick them up some power tools just feel right, regardless of size or shape. 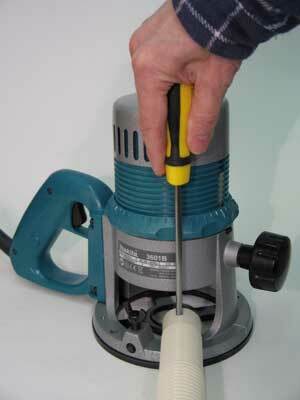 Such a one for me is the new fixed-base router from Makita. With boundaries and distinctions between the UK and the USA ever blurring, it's no surprise that this one was released for sale here in the UK at the same time as the natural and more obvious retail destination of the USA. 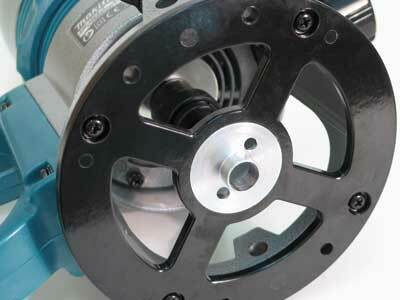 Massively popular in the States, the fixed-base configuration is starting to gain a following here in Britain while, conversely, plunge routers are fast becoming a common sight in workshops across North America. Different in appearance from most other routers on the market - a possible selling point in my opinion - the 3601B has a side or D-handle as the primary means of control; this is also where the on/off trigger is sited, and an accompanying press-in and release safety lock button ensures that the machine isn't started accidentally when not in actual use. A hefty knob on the opposing side offers additional leverage as well as providing a solid and reliable lock once the depth of cut has been established. 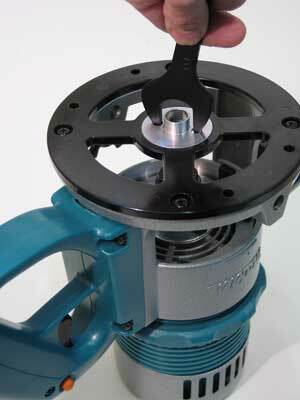 Unlike the familiar plunge-configuration router, where the user is always fighting the inbuilt spring pressure during a setup, the Makita fixed-base machine is much easier to adjust. A giant threaded micrometer ring provides a means of accurately controlling vertical movement of the motor and collet assembly and, while gravity will assist the descent to your required depth setting, any reverse or upward motion will need a bit of help. For once I actually enjoyed setting depth of cut during my trials with this router, the big blue adjuster ring inspiring a sense of confidence and eliminating any guesswork from the proceedings. In Europe, collet size is one of the few areas where imperial measurements still dominate, with new routers continuing to take 1/2in, 1/4in and 3/8in bits, to accommodate the huge established market for tooling. 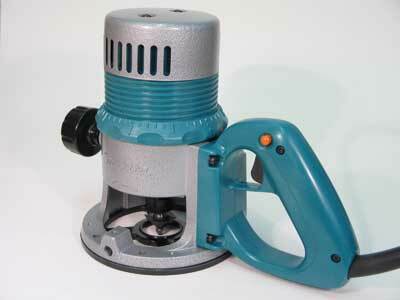 So it is with the new Makita. The default collet is the 1/2in as befits a machine designed for constant running of edge mouldings and template work, with collet sleeves for the other two sizes being supplied as part of the kit. With a nice wide base and a low centre of gravity, this is a very steady router indeed, and one-handed working - left or right - soon becomes comfortable after a little (safe) practice. After a bit of rebate work I checked the power rating of this router and was surprised to see it as 930W, as it felt more than that in use; it seems that Makita are bucking the recent trend of increasingly bigger and more powerful machines with this one, and why not if a smaller one is up to the job? I also liked the immediate start on this one; none of that waiting around for the thing to run up to speed, it was switch-on-start-work, just like routers used to be. 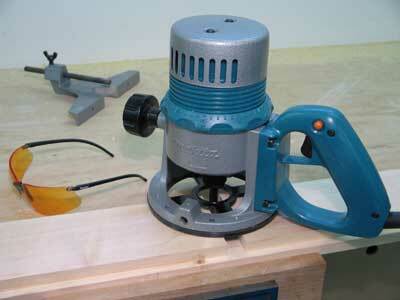 This is a good professional workhorse of a router, ideal for the busy workshop. Industrially rated, it is robust and stable and is only let down by its extraction hose which lacks the usual effective clear plastic shrouding. 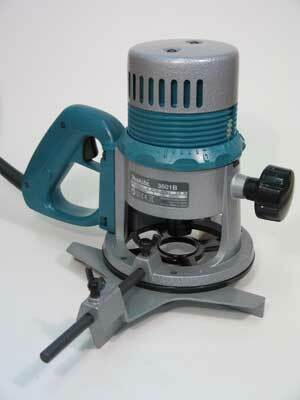 "This is a good professional workhorse of a router, ideal for the busy workshop"
A nice collection of accessories includes a very solid fence which is mountable from either side, and clamps tightly into position for reliable accuracy. 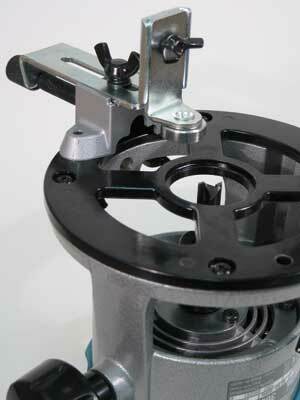 There's also a bearing-mounted roller guide which locks onto the base and provides a means of following curved and freeform edges for trimming and moulding jobs. For anyone fed up with losing the mounting screws for their guidebushes, the one for this D-handled Makita is a real treat; self-threaded, it simply screws into the router base, and I quickly discovered that the smaller of the two collet spanners was ideal for its final tightening. Good stuff.